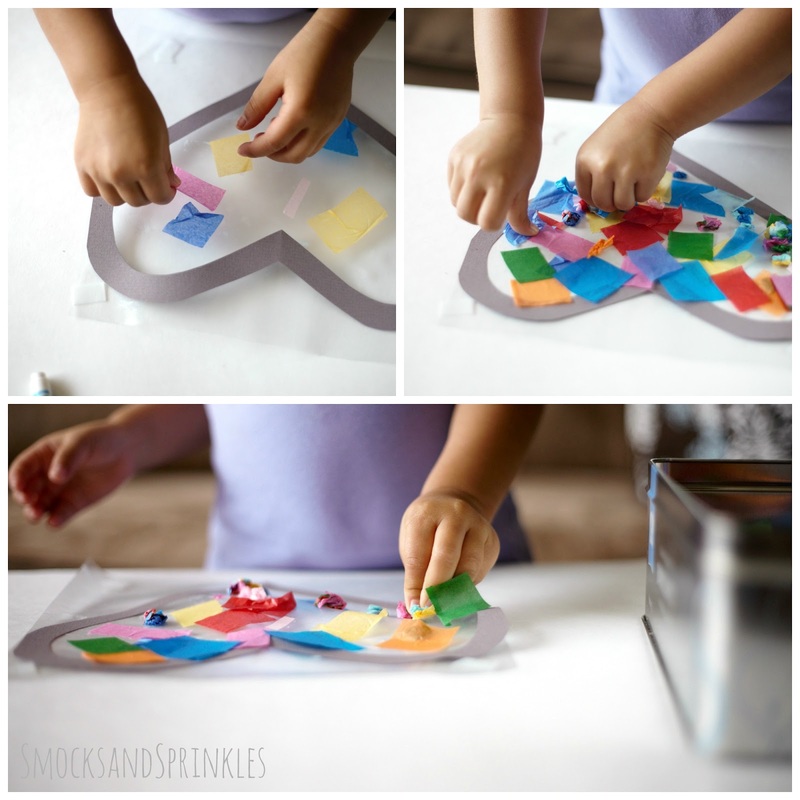 Smocks and Sprinkles: Easiest Stained Glass ever! I needed to keep my toddler busy today, so it was craft central here! 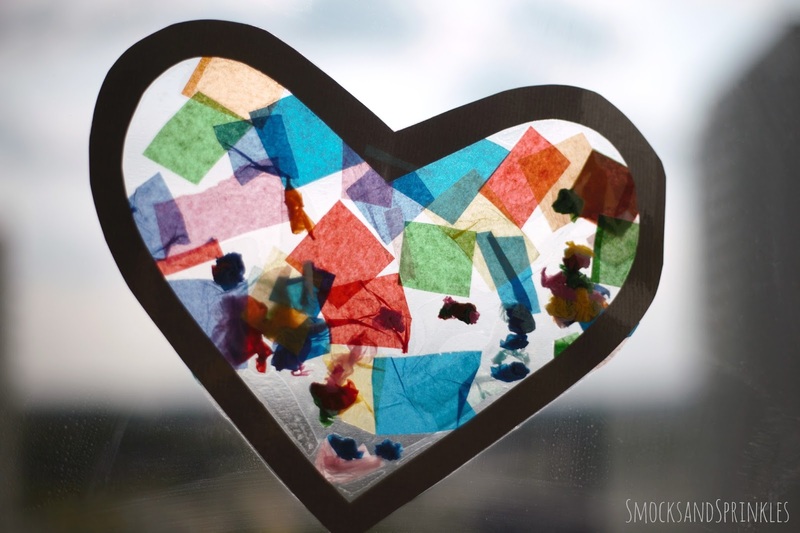 I keep a stash of precut tissue paper squares for all sorts of art activities, and today it was stained glass. These look beautiful in the window and are great for any occasion. The best part is, they keep your toddler busy for a while! Tip! If you can't find clear contact paper or something similar, you can use wax paper or acetate and adhere the tissue paper using a glue stick, or watered-down glue. Cut your contact paper into a 2 squares/rectangles (make sure it will fit the frame shape you want to use). Keep the paper backing on while you do this! Next, cut your tissue paper into smaller squares. If you want to get organic with it, you can rip it or cut it into random shapes. 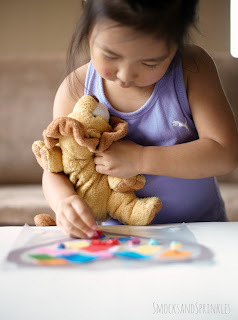 Your junior crafter can definitely help with this! Cut out the construction paper frame for your stained glass. If you want to keep it simple, just cut out 4 strips to paste along the outside. 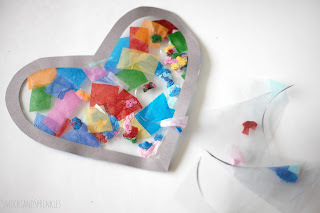 Make a few loops with your tape and adhere it to the contact paper (on the shiny side, not the paper side) and stick it to your work surface (this will keep it from rolling up when you peel off the paper backing). Peel the paper backing off the contact paper and adhere your construction paper frame and shapes. Now the fun begins! Start to stick the tissue paper on your sticky contact paper. 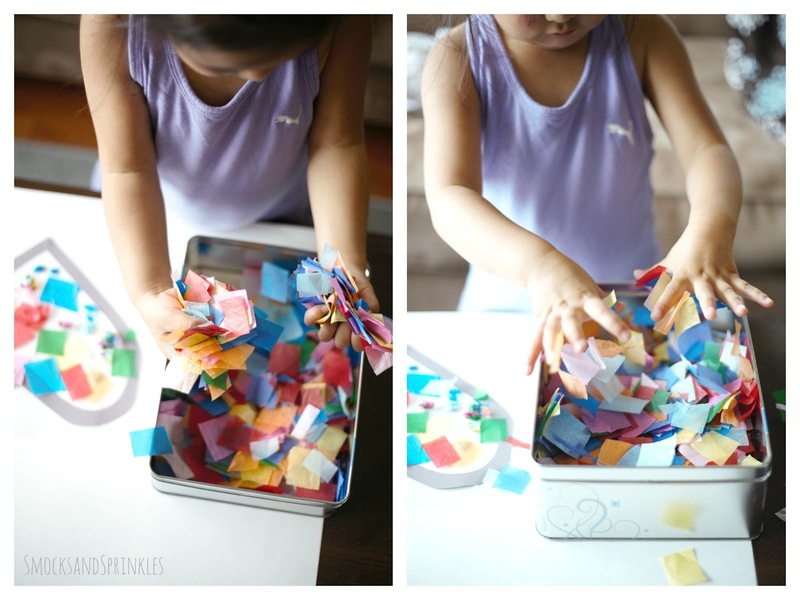 You can get your children to do this part (I've done this with kids as young as 2 years old. Younger than that and they tend to eat the tissue!). Keep sticking until all the stickiness is covered. Or you can leave some parts exposed...this will depend on the attention span of your child. Or you? She decided to crumple the tissue paper. Type A me died a little inside. Optional: Once you're happy with the tissue paper placement, take the other piece of contact paper and peel off the backing. Carefully lay it sticky side down on top of the tissue paper, to seal it all in. 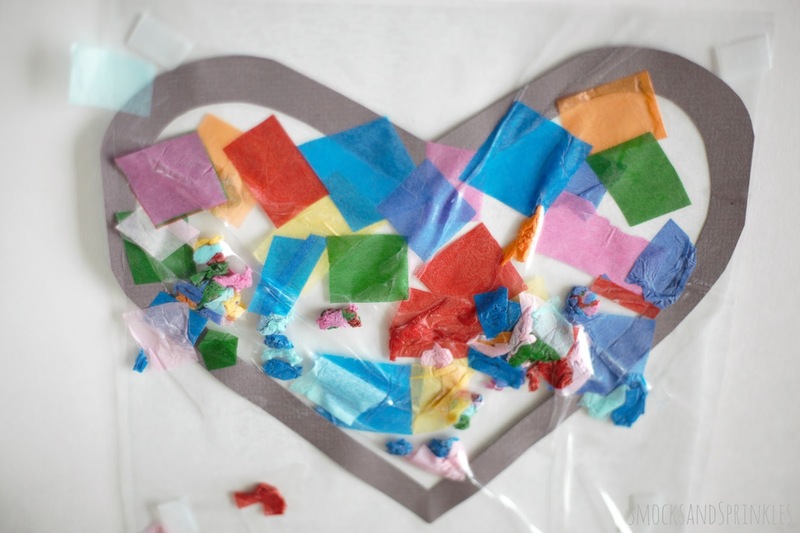 If you don't want to do this, you can leave the tissue paper exposed to keep it simple. 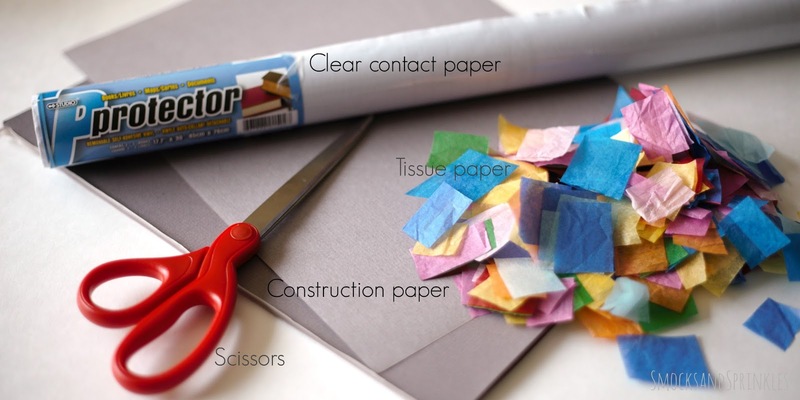 Use your scissors to trim off any excess contact paper around the outside of your frame. Tip! 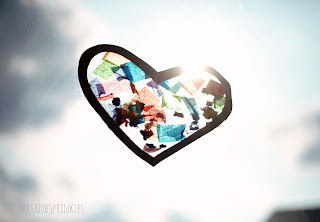 If you're feeling fancy, you can also cut some shapes out of the black paper as silhouettes for the centre of your stained glass. Stick these on before you start the tissue paper in step #6. Voila! You're done! Isn't it amazing? Aren't YOU amazing? The shapes make it really customizable! Making them for Valentines' Day? Cut out a bunch of hearts. Thanksgiving? Cut out some leaves or pumpkins! If you're feeling really fancy, you can cut thinner strips of black paper to act as the "lead" piping and make a design on your contact paper before adhering the tissue paper. The sky is the limit! If you make this with your kids, be sure to let us know how it went! We'd love to see your masterpieces.